The photograph of Handcross Park appears in the memoirs of Mrs Ena Tulley (1897-1973), the wife of Ralph Tulley of the village post office. She describes the early history of Handcross House and Handcross Park and a transcription of this can be found by selecting Open Document. 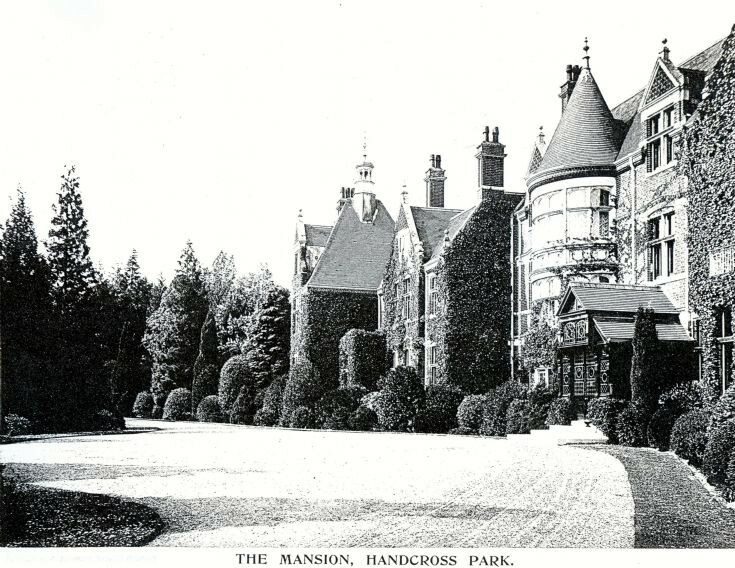 Handcross Park was selected to appear in a book dedicated to recording all the important country houses in Britain in the early 1900s. The work informs us that a veteran of the Peninsular War (1807-1814), General Robert Dudley Blake, purchased a plot of land in Handcross on which he built Handcross House in 1825, and where he lived until his death in 1850. Robert married an Irish girl, Helen Sheridan, and they had one child who died in infancy. On Robert’s death, Helen inherited the whole of his large estate, and she also inherited the whole estate of Robert’s brother, Sir Francis Blake, who died without legitimate issue. On Helen’s death in 1876, aged 76, her estate amounted to about £120,000 in property and cash, making her a multi-millionaire in today’s money. She died intestate and as no legimate claims were received (although several illegitimate claims were filed; 48 at the last count!) the whole estate was seized by the Crown. There is a lot of fascinating information on the internet describing the “Blake Millions”.